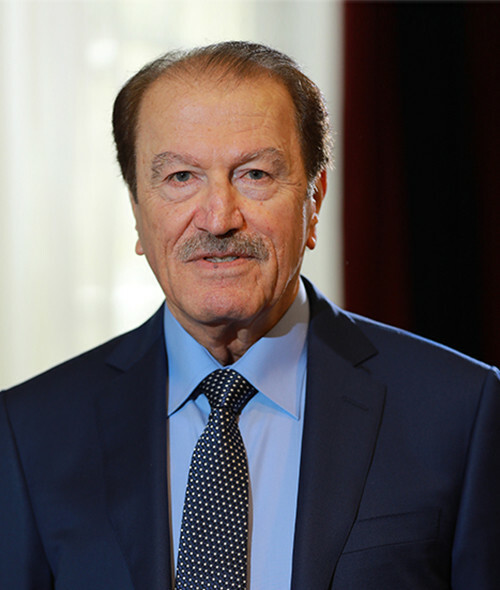 Mr. Riad Al-Sadik is Chairman of Al Habtoor Leighton Group and a member of the boards of trustees of the Institute for Palestine Studies and The American University of Sharjah. His journey, which started in Palestine where he was born, has taken him to different corners of the world, including Lebanon where he graduated from the American University of Beirut. Beyond his business interests, Riad is an active philanthropist who promotes the improvement of industry standards and supports the humanities. He is Vice Chairman of the Board of Governors of the Pearl Initiative as well as on the Board of Trustees of the Institute for Palestine Studies, Birzeit University, Bethlehem Development Board and the American University of Sharjah. He is also a sponsor for the Riad Toufic Al-Sadik Chair of Civil Engineering at the American University of Sharjah and the “Riad Toufic Al-Sadik School of Law and Management” at Birzeit University. Riad has a degree of Civil Engineering from the American University of Beirut. He is a firm believer in the lesson that success comes to those who love what they do. To those, he says: "You should always remember that you are part of society and that the welfare of society is part of what you do."